The STEREO science center now has the real-time IMPACT and SWAVES data up. Check out their website to see what the solar wind and solar magnetic field (interplanetary magnetic field) is doing right now, as measured by the two STEREO satellites. Today the Sun is still VERY quiet. We are in solar minimum and there are no waves to be seen, the magnetic field data is relatively steady, and there are very few high energy particles - just the normal solar wind is blowing out with its magnetic field, past Earth and all the other planets in our solar system. Naked Science - "Solar Force" TV show, which prominently features STEREO will be premiering on the National Geographic Channel Oct. 30 at 9:00 ET. Check out this link for more information. After this time, the program will replay a number of times. The Sun has been incredibly quiet. Only coronal holes have opened up the Sun to connect high speed particles that interact with Earth's magnetic field to add energy to Earth's magnetosphere, enhancing auroras. This has been a great time for the STEREO team to study these coronal holes and streamers and other things, like the interaction of the solar wind with comets. To read more about a case when STEREO saw a comet's tail get swept away but the solar wind, visit NASA's STEREO mission web site or the New Scientists' web page. 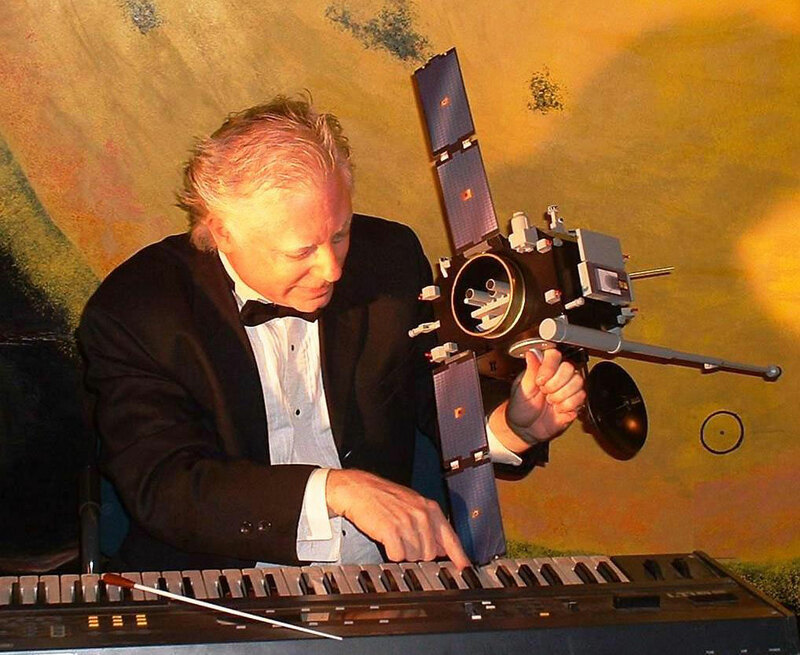 Marty Quinn of Quinn Arts, plays his solar music while holding a model of the STEREO spacecraft. Mr. Quinn is working with the STEREO Education and Public Outreach (E/PO) teams to create a museum exhibit that takes the STEREO data and turns it in music. A new Flash animation has been added to STEREO-Impact In the Classroom. See what happens to the Earth and the STEREO satellites during a Coronal Mass Ejection (CME). Check out the first STEREOscopic images released at NASA's STEREO site. The education sounds project has created a new page with STEREO IMPACT and SWAVES data. Listen to the newest STEREO data on this "Latest sounds of STEREO" website. No human has ever witnessed a solar eclipse quite like this: NASA's STEREO-B spacecraft was about a million miles from Earth last month when it photographed the Moon passing in front of the Sun. The resulting movie looks like it came from an alien solar system. Read the full story at Science@NASA Headlines. Note that this story is wrong in its explanations of the STEREO calibration. The SOHO release on the 1999 transit of Mercury got it right: "The difficulty in obtaining accurate data from coronal measurements is caused by the amount of light coming from the solar disk (much brighter than the dim corona) that bounces around inside the instruments. This scattered light is also referred to by scientists as stray light. "From SOHO's perspective, 1.5 million kilometers from Earth, the closest approach of Mercury to the Sun was at an angle of about 92 arc seconds. The planet passed just above the disk, right in front of the corona. By so doing, the planet intercepted a small part of the coronal light." "Whatever is not black inside the shadow image of Mercury is scattered light inside the instrument. Distinguishing between light from the solar disk and that from the corona will allow more refined measurements of the corona." This page has been updated with a link to the NASA animation and graphics page for STEREO. Visit that on the left if you would like to find STEREO animations and graphics to use for free. IMPACT produces its first science nugget about a Solar Energetic Particle event and Coronal Mass Ejection (CME) measured by the STEREO IMPACT instruments December 5-16th. This event was somewhat surprising because of the current quiet state of the Sun, near the minimum phase of its activity cycle. To read the science nugget, visit the IMPACT science news and events page. Baltimore Examiner posted this article about STEREO today. The Baltimore Sun also wrote an informative article about the STEREO mission. See Articles section. A press release from The Applied Physics Laboratory at Johns Hopkins University about the STEREO mission as well as STEREO's recent swing past the Moon. See Articles section. STEREO has now started its science mission! The STEREO satellites completed a series of complex maneuvers using the moon's gravity to position the spacecraft in their mission orbits around the Sun. The spacecraft will be in position to produce the first 3-D images of the Sun by April. The Applied Physics Laboratory (APL) has a full press release with photos, which can be found at: here.